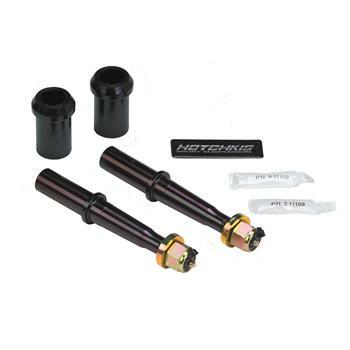 The Hotchkis Pivot Shaft Kit reduces the worn out sloppy handling lower control arm pivot shafts on your A B or E body Mopar. Designed to be direct replacements for stock these shafts are a greasable design. The grease fittings offer added convenience as well as increased performance by reducing friction and suspension bind. Worn out pivot shafts can create sloppy handling and are recommended to be replaced especially when installing new polyurethane bushings. Kit comes complete with two greasable shafts polyurethane bushings and grade 8 hardware.